This is the classic peanut butter/celery stick snack converted to a delicious and filling sandwich! 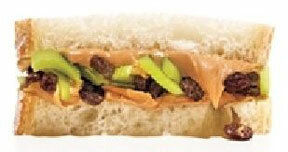 Spread peanut butter on one slice of bread then layer with celery and sprinle with raisins. Top with another piece of bread (you can put peanut butter on top slice as well) to form one sandwich. Repeat to form second sandwich.